Congratulations to all the winners of the 2018 edition of the IUCr worldwide crystal growing competition! All entries have been evaluated by an international judging panel based on creativity, aesthetic value, description of the working plan and experimental work, clarity of explanations, scientific background and safety. Gold, silver and bronze medals were assigned to each of the three categories based on the age of participants. Now enjoy watching the videos! Congratulations to all the winners of the 2017 edition of the IUCr worldwide crystal growing competition! Congratulations to all the winners of the 2016 edition of the IUCr worldwide crystal growing competition! To coincide with the 1st Panafrican Conference on Crystallography (PCCr1), a Bruker portable X2S single-crystal diffractometer will be made available at the University of Dschang. During the days of the conference, two Bruker delegates, Eric Hovestreydt and Loïc Le Dréau, will assist for installation, demonstration and data collections and analyses. Support will be given by IUCr delegates, Claude Lecomte and Michele Zema and local organizer Patrick Kenfack. The Bruker system is intended to remain at the University of Dschang for a period of few months after the PCCr1 conference, allowing local researchers to conduct in-house XRD single-crystal measurements. During these period, dedicated courses will be organized locally to train young students. 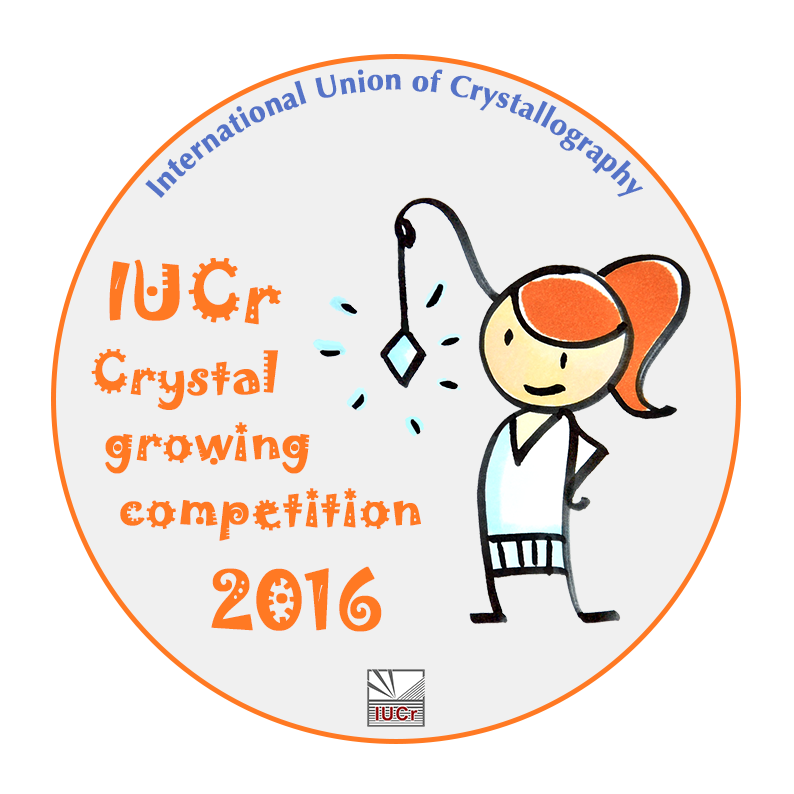 The 2016 edition of the IUCr Crystal growing competition is now open! All schoolchildren are invited to submit their videos and convey their experience of growing crystals. This initiative was originally launched in 2014 as part of the celebrations for the International Year of Crystallography and has now reached its third edition. 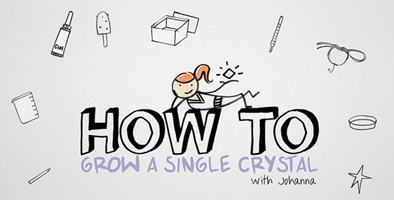 Learn with Joanna how to grow fantastic crystals in this video by Sabine Allaeys and watch the winning videos of previous editions here. 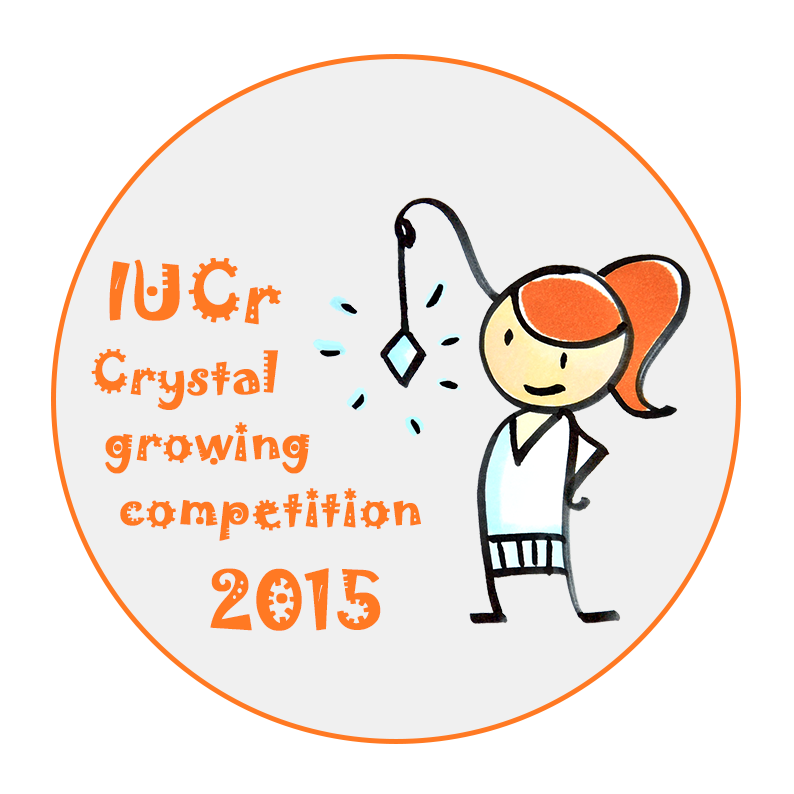 Congratulations to all the winners of the 2015 edition of the IUCr worldwide crystal growing competition! All entries have been evaluated by an international judging panel based on creativity, aesthetic value, description of the working plan and experimental work, clarity of explanations and scientific background. From Africa to Latin America, the IUCr-UNESCO OpenLab initiative is offering high-quality educational opportunities to more and more young researchers. Last September 2015, two OpenLabs, equally successful, were held in Kenya (with CCDC) and Mexico (with PANalytical). Both events were attended by over 80 students from the hosting country as well as from neighbouring countries, in the spirit of promoting intra-regional cooperation. Read the reports by Juliette Pradon and Patricia Gitari about the IUCr-UNESCO-CCDC OpenLab Kenya and by Luis Miguel Martinez about the IUCr-UNESCO-PANalytical OpenLab Mexico 2. Photo galleries are available on facebook. Read the article on National Geographic España magazine about the exhibition Cristales by Juanma Garcia Ruiz. "We want to convey not only the beauty of crystals but also explain how they have contributed to the welfare of society, especially in biomedicine and in the synthesis of new materials" explains Juanma to the readers of National Geographic. A full article describing the concept and content of the exhibition which was launched on the occasion of the International Year of Crystallography, has been recently published on the Journal of Applied Crystallography. Read this leading article on the IUCr home page to find out why we are asking you as individuals to endorse the IYCr2014 Legacy Resolution ... and then please add your name to the list of supporters. As of today, 11 Sept 2015, 149 people have signed the resolution. 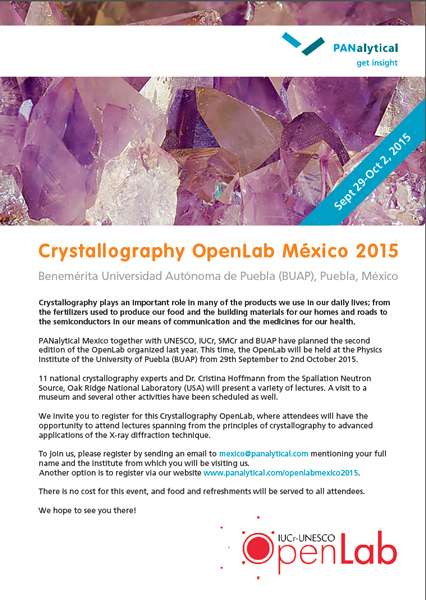 Registrations are open for the second edition of the IUCr-UNESCO OpenLab Mexico, which will be held at Puebla on 29 Spetember to 2 October 2015. The main partner for this event is PANalytical BV. The OpenLab is organized in collaboration with the Sociedad Mexicana de Cristalografía (SMCr) and the Benemérita Universidad Autónoma de Puebla (BUAP). The programme will include lectures and tutorials held by 11 national crystallography experts and special invited lecturer Dr. Cristina Hoffman, from Spallation Neutron Source, Oak Ridge National Laboratory, USA. A visit to a Museum and several other activities are scheduled as well. Registration is at no cost. Accommodations at special rates are provided. 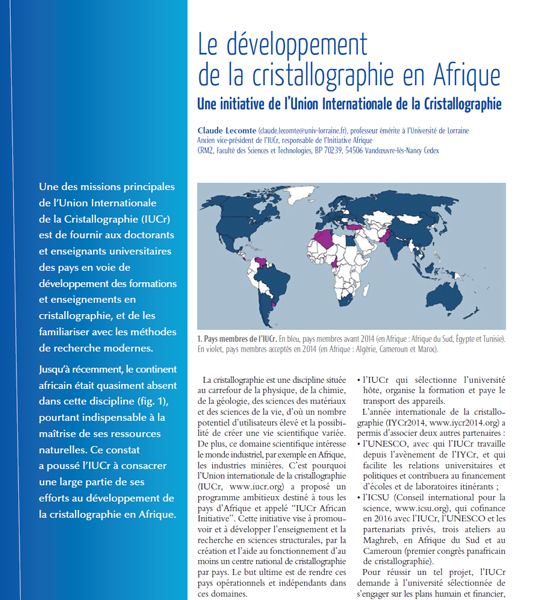 Claude Lecomte, coordinator of the IUCr Crystallography in Africa initiative, describes the recent developments of crystallography in Africa in this article published on vol. 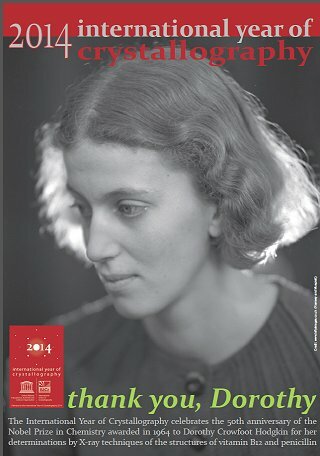 44-45 of Reflets de la physics, the newsletter of the Société Française de Physique (SFP). Lecomte's article is availble here in pdf format. 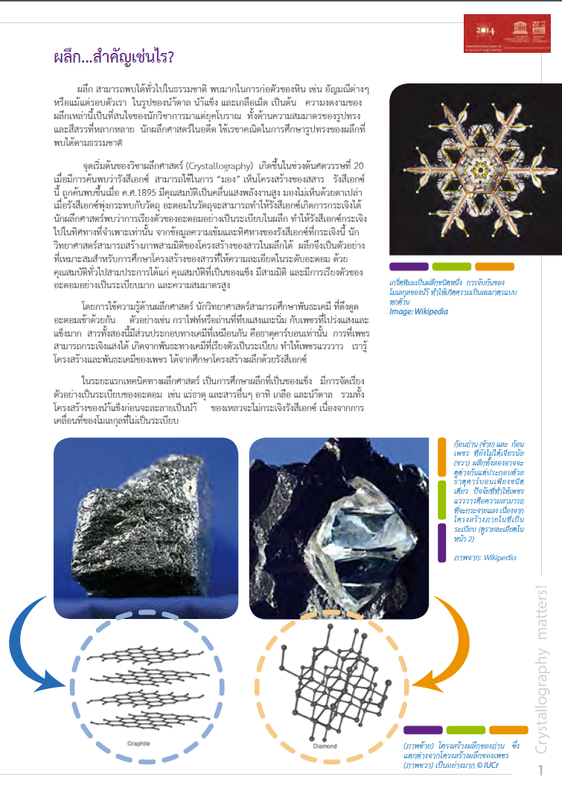 The issue of Reflets de la physique is entirely dedicated to crystallography and entitled "La cristallographie, science et techniques". Click on read more to see the table of content. Most of the articles are open access and can be downloaded for free. While the OpenLab Kenya, in partnership with CCDC, is taking place in these days at Kenyatta University and University of Nairobi (see a photo gallery here), other OpenLabs are scheduled in the calendar for 2015 in Mexico (in partnership with PANalytical), Senegal and Vietnam (in partnership with Bruker). The year 2016 will start with the second edition of the OpenLab Cambodia on 11-15 January. Marvin Hackert, President of the IUCr, answers some questions about IYCr2014 and forthcoming events in this article on the ICSU Annual Report 2014 (find it at pag. 17). As the final formal action of the International Year of Crystallography, after reviewing the worldwide accomplishments and achievements in the Conference "Crystallography for the next generation", the IUCr has released a resolution with a forward-looking focus on how to sustain momentum and build on the success of the Year. The resolution has been signed so far by representatives of the IUCr, UNESCO, TWAS, ICSU Regional Office for Africa, IUBMB and IUPAP. The organisations signing the resolution commit, through a number of activities, to (i) enhance the stature of crystallography, (ii) build capacity in developing regions of the world and (iii) extend further the public understanding of science in general and crystallography in particular. We invite individuals to add their own private endorsement of the actions and goals set out in the IYCr2014 Legacy Resolution by completing the form at http://www.iycr2014.org/declarations/legacy-endorsement. The second edition of the IUCr Crystal growing competition is now open to schoolchildren from every part of the world. To enter the contest, participants must submit their videos by 22 November 2015. We aim at building a network of local, national or regional crystal growing contests and we invite all coordinators to contact and join us. As part of the international network of crystal growing competitions, you will be entitled to use this badge and invite your participants to send their videos to the IUCr and have an extra opportunity to win a prize at the worldwide level! 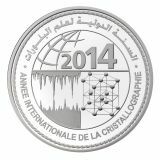 Watch the movie of the official announcement of the winners of the IYCr2014 crystal growing competition at the IYCr legacy conference "Crystallography for the next generation" in Rabat, 22-24 April 2015. A photo gallery of the laureates with their medals and certificates is on our facebook page. If you haven't done it so far, please send us your photo and we will add it to the gallery. Congratulations to J.M. Garcia-Ruiz, F. Otalora, A. Garcia-Caballero, L.A. González-Ramíreza and C. Verdugo-Escamillaa on publishing their article "CRISTALES: a world to discover. An exhibition for schools and universities" on the Journal of Applied Crystallography. The exhibition CRISTALES was designed and launched on the occasion of the International Year of Crystallography. 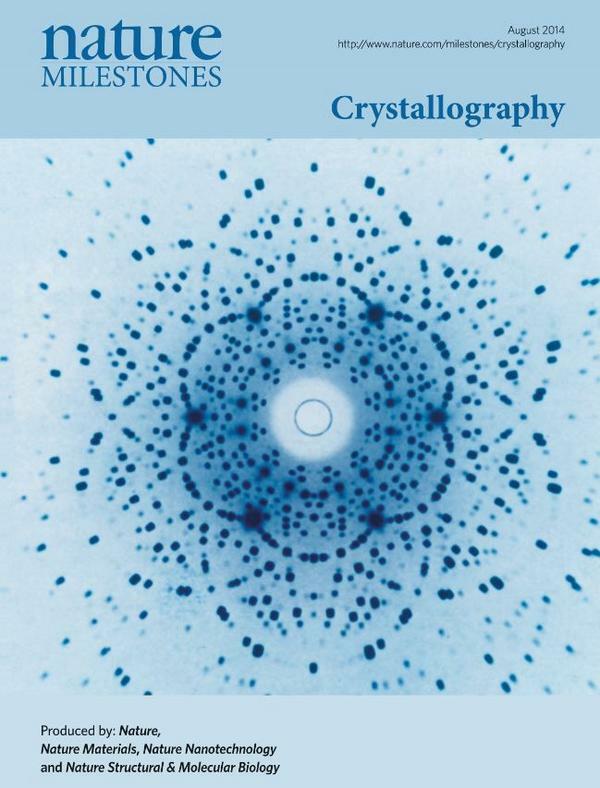 It aims to convey a fresh insight into crystallography by placing an emphasis on the most appealing aspects and the most important contributions of crystallography to society, including new materials, solar energy, drug research, electronic materials, cosmetics and the design of new chemicals to improve industrial processes in various fields. CRISTALES has been specifically developed for schools and universities and is composed of 14 posters, all shown and thoroughly described in the paper. India will host the 24th Congress & General Assembly of the International Union of Crystallography from 21st to 28th August 2017. A cutting edge program with plenaries, keynotes, microsymposia and posters, commercial exhibits, satellite meetings, workshops and official meetings of the IUCr is planned. This will be a state of the art international meeting set in the unique ambience of India. Hyderabad is a modern city of 9 million people that has gained prominence as an important software and pharmaceutical centre. Its iconic symbol is the Charminar or four minarets, which draws its inspiration from the tetragonal crystal system. It is the central motif in our logo for IUCr 2017. The web site for the Congress is now available and functional. Find out information about the venue and much much more! 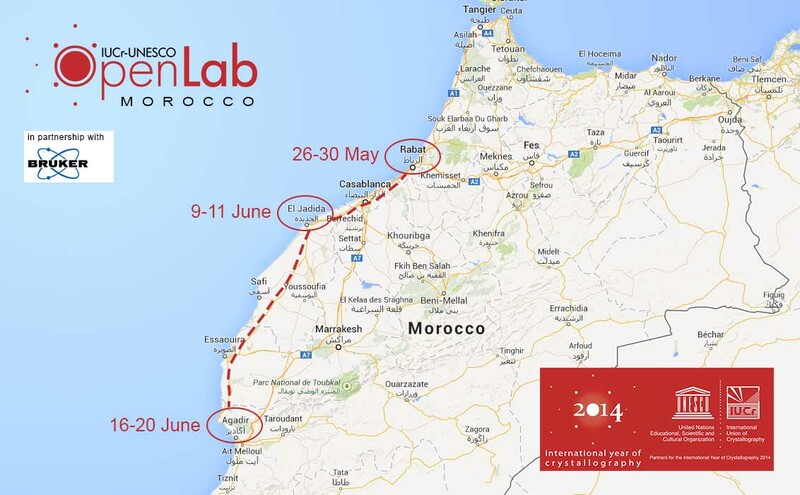 The IUCr-UNESCO OpenLab Tunisia has been successfully held in the form of a travelling lab. Thanks to the partnership with Bruker AXS, a portable powder diffractomer D2 has travelled to Monastir first (14-17 May 2015) and then to Nabeul (20-23 May 2015). More than 50 students attended in total the workshops organized in the two venues by Mohsen Graia (Monastir) and Habib Boughzala (Nabeul). Big thanks to them and to the Tunisian Crystallographic Association for the wonderful organization. Great success for the IUCr-UNESCO OpenLab Algeria, which was held at the Université frères Mentouri in Constantine from 9 to 14 May 2015 and organized in partnership with Bruker. A total of 80 students (40 from Constantine and 40 from other Algerian as well as Tunisian and Moroccan universities) have attended the OpenLab, which also included several hands-on tutorials and the exhibition "Voyage dans le Cristal". Click here to download the programme book of the event. A photo gallery will be available soon. This is the number of events associated with the International Year of Crystallography and listed on the IYCr Calendar of events. The actual number of initiatives, events and activities organized and carried out to celebrate IYCr2014 is anyway definitely higher than 545! Therefore, if you have organized an event and this is not listed on the Calendar, please send all details to iycr2014@iucr.org. This will help create a full archive of what IYCr2014 has been. The iycr2014.org web site is undergoing some restructuring in order to prepare the archive of what the International Year of Crystallography has been and to focus on its legacy and the many initiatives that will continue throughout the coming years. Start browsing the new menu and the new contents, and come back often to see a brand new web site. 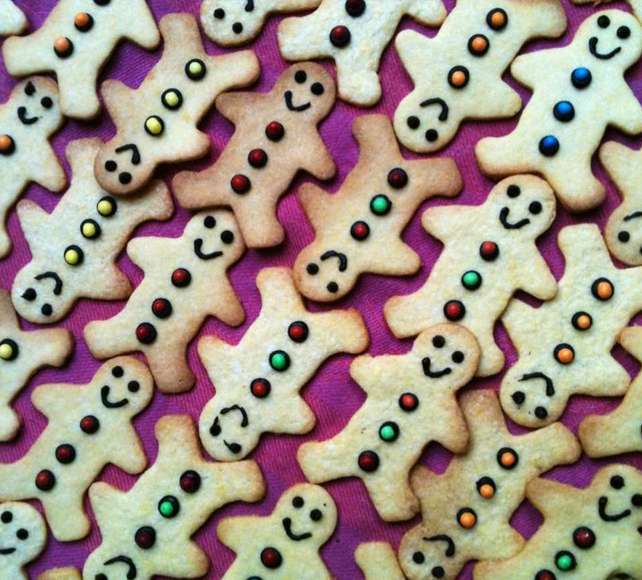 CRISTALLI! 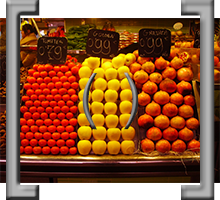 @Parma had an amazing impact on the public, attracting 12,500 visitors in 7 weeks. The crowds attending the guided tours with experiments at the weekends were impressive, with everyone showing a real enthusiasm for crystals and ready to learn all the (crystalline) faces of cheese, ham, sugar, ice cream and medicines. Read the full report by Alessia Bacchi about this and other initiatives in Italy. We are delighted to announce that the stunningly successful Crystallography365 blog has found an additional home on the Crystallography matters ... more! website. This superb project was one of the public outreach highlights of the International Year of Crystallography 2014. Every day through the year, Helen Maynard-Caseley and her team posted a different crystal structure, introducing the public at large to some of the most important crystal structures ever determined, and offering information and entertainment on a whole host of others. Among the individual structures and themed collections to explore are DNA and the ribosome; haemoglobin, vitamin B12 and cellulose; the many different phases of ice; the composition of Planet Earth; the reason a lobster changes colour on cooking; new discoveries in battery technology; birthstones and other gems; extraterrestrial materials; and many, many more. 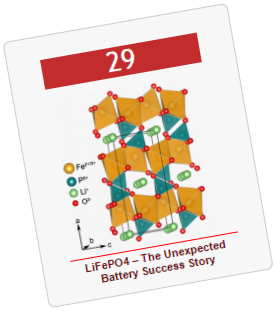 Bookmark the perpetual calendar feature of Crystallography365, and treat yourself to a fresh insight to the world of crystallography every day. The laureates of the special crystal-growing competition organized by the International Union of Crystallography and UNESCO for selected schools belonging to the UNESCO Associated Schools Network have been announced. Prizes has been awarded to schools in Singapore, Benin and Argentina. 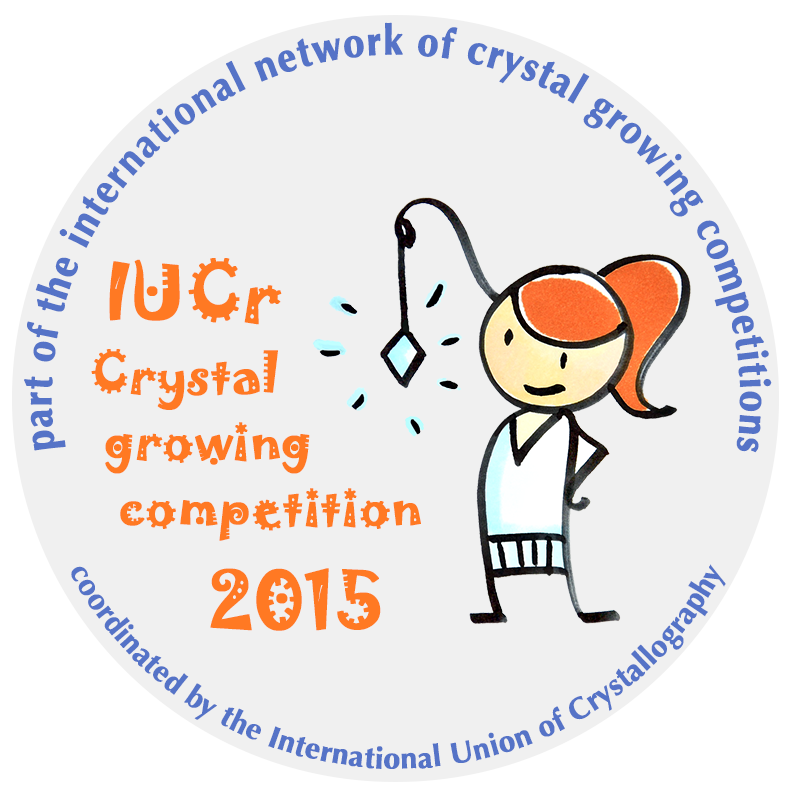 Visit the IYCr crystal-growing competition web page for more details. It is with great honour that we announce that the conference "Crystallography for the next generation: the legacy of IYCr" (Rabat, 22-24 April 2015) has received the High Patronage of the King Mohamed VI. We are proud to announce that the IUCr has been awarded a grant for the project "Building Science Capacity in Africa via Crystallography" under the ICSU Grants Programme 2015. The proposal was prepared as a follow-up to the IYCr Pan African Summit meeting (Bloemfontein, October 2014) and submitted by the IUCr (as an ICSU member) on behalf of Andreas Roodt, President of ECA and chair of the Summit meeting, and Michele Zema, IYCr Project Manager and IUCr representative for the proposal. The project aims at further cementing the African Crystallographic Association (AfCA), whose Steering Committee has been established at the Summit meeting in Bloemfontein in October 2014. The programme will be conducted as part of the IUCr Crystallography in Africa initiative. (iii) Bring African scientists to the INDABA series of conferences in South Africa (latter part of 2015) to expose them to high level International interdisciplinary science. Moreover, the project includes many additional actions, which will be unertaken pending on availability of funds, infra structure and human resources. In her article "Biochemistry researchers share their work with the public in crystallography's centenary year", Jane Itzhaki reports about the variety of activities contributed by crystallographers from the Biochemistry Department of University of Oxford to celebrate IYCr2014. Professor Elspeth Garman commented: “The year has really raised the profile of the topic internationally and has resulted in lots of outreach and public engagement activities, there is a new energy and it has really benefited countries where there is limited activities in the field. Some of the initiatives will undoubtedly be continued". About one month to go before the IYCr Legacy initiative is officially launched during the Crystallography for the next generation conference in Rabat (22-24 April 2015), and more than 300 participants from 44 countries have already registered to attend it. Some places are still available, but registrations will be closed when the capacity of the lecture theater at the Academy of Science and Technology of Morocco is reached. Register here. Participation is free. Winners of the IYCr2014 crystal growing competition - Section "Essays" have been announced. Congratulations to C.P.E.M. n° 28, Colegio Nacional de Buenos Aires (Argentina) and Sharada Vidyanikethana Public School (India) on being awarded the gold medals, and to all other laureates and participants. Enjoy watching the winning videos and reading the winning essays here. The official announcement of the laureates of both sections (videos and essays) will take place during the IYCr2014 Legacy launch conference in Rabat (22-24 April 2015). 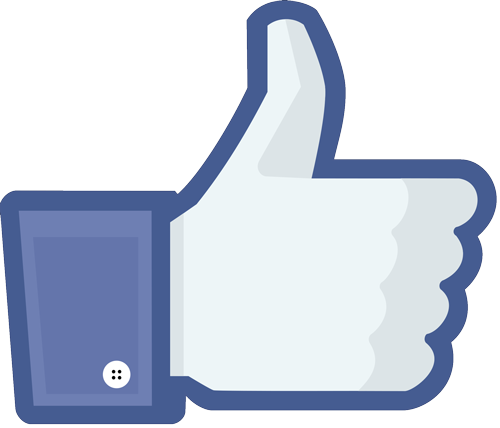 2014 is over but the IYCr Facebook community is still growing and today we have reached 4000 likes! 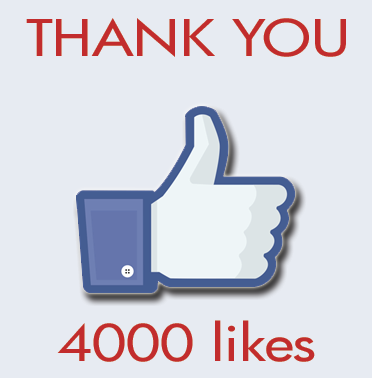 Thank you so much to everyone and particularly to Hossam Mohamed Abdelatef, who was number 4000. 112 participants, including 12 international guests (Thailand, Malaysia, Canada), 12 from outside Ho Chi Minh City and 84 from different institutes and universities in Ho Chi Minh City, have attended the IUCr-UNESCO OpenLab Vietnam, organized in partnership with Bruker at the Chemistry Department of the VNUHCM-University of Science and the MANAR Centre. Click here to read the report of Nguyen Tuyet Phuong (Ho Chi Minh City) and Luc Van Meervelt (KU Leuven). Thirty-four students and young scientists from Colombia, Venezuela, Bolivia, and Costa Rica attended the IUCr-UNESCO OpenLab Colombia, dedicated to single crystal diffraction and partnered by Rigaku. The OpenLab was held at the Guatiguará campus of Universidad Industrial de Santander (UIS) in Bucaramanga, Colombia, on 27 to 31 October 2014. Click here to read the report of José Antonio Henao (UIS, Colombia), Miguel Delgado and Graciela Díaz de Delgado (ULA, Venezuela). "Events like this must be organized more often"
The IUCr-UNESCO OpenLab Turkey was conducted at Bilkent University, National Nanotechnology Research Center (UNAM) in January 19-22 2015 with the support of PANalytical, Atomika Teknik and the Turkish Crystallography Association. The event brought together over 30 participants from several countries and cities. The participants conveyed their gratitude and satisfaction with the event, remarking that such events must be organized more often due to their exceptional contributions to their research and knowledge. The panel of judges have been faced with a huge number of noteworthy entries. All videos have been evaluated based on creativity, aesthetic value, description of the working plan and experimental work, clarity of explanations and scientific background. Gold, silver and bronze medals (5 for each category) have been assigned, and 12 videos have received an honorary mention. Special prizes go also to the category "Creativity". The official announcement of the laureates will take place during the IYCr2014 Legacy launch conference in Rabat (22-24 April 2015). Register now to attend the "IYCr legacy" conference, which will be held in lieu of a "Closing" ceremony for the International Year of Crystallography. The conference will take place at the Hassan II Academy of Science and Technology in Rabat (Morocco) on 22-24 April 2015. A welcoming reception will follow the opening ceremony on Wednesday 22 April, starting at 5 pm. The year 2014 was declared the International Year of Crystallography by the United Nations in order to raise awareness in the world at large about the importance of crystallography in the modern world. Through an incredible variety of activities worldwide, that objective has been brought to life for thousands of schoolchildren, university students and the general public. Many events have been sponsored by UNESCO and the International Union of Crystallography, supported by industrial and academic sponsors, and made real by a host of willing volunteers. They have ranged from Science Fairs for schoolchildren, to professional-level OpenLab workshops and training sessions, to international summit meetings to shape future policy. They have ignited a fire in the new generation, most especially in parts of the developing world where structural science is still an infant science. Crystallography now matters ... more! An "IYCr legacy fund" has been established and everyone can donate to support these initiatives. The conference "Crystallography for the next generation: the legacy of IYCr" will be held in Rabat (Morocco) on 23-24 April 2015 and is aimed at reviewing all the activities associated with IYCr - all that has been (and is being) done, what was successful, what was not so successful, etc. - and discussing how to transform the activities into long-term sustainable actions. Participation is free but registration is required. The IUCr-UNESCO OpenLab Mexico, partnered by PANalytical, has been held at the Instituto de Geología (IGEOL) of the UNAM (Universidad Nacional Autónoma de México) and was attended by 60 students mostly from Mexico but also from other Latin-American countries. 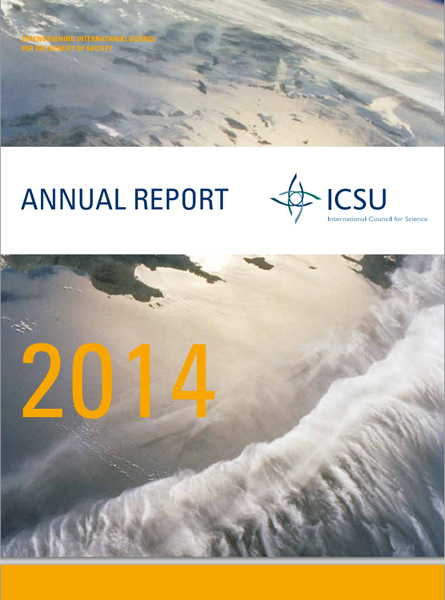 Click here to read the report by Dr Teresa Pi Puig, organizer of the event. Since mid-2013, when a Rigaku MiniFlex X-ray diffractometer was installed at the Department of Geo-resources and Geotechnical Engineering (GGE) at the Institute of Technology of Cambodia (ITC), the students in the department have been introduced to X-ray diffraction and crystallography. To increase their knowledge, the first IUCr-UNESCO OpenLab in Cambodia, in partnership with Rigaku, was held at the ITC in conjunction with IYCr2014 from July 7 to 11, 2014. While the OpenLab Hong Kong (partnered by Agilent and OlexSys) is just over and the OpenLab Vietnam (partnered by Bruker) is taking place in these days, the number of applications for the OpenLab Turkey 2 (partnered by PANalytical, to be held in Ankara on 19-22 January 2015), has already reached 90, with entries from 22 different countries! Final deadline is 15 December. Every effort will be made to increase the capacity of the OpenLab. Notifications to selected participants are due by the end of next week. Ri Channel wins European award! Congratulations to the Royal Institution Channel team on winning the New Media award sponsored by EuroScience for the 'Celebrating Crystallography' animation at the European Science TV and New Media Awards! 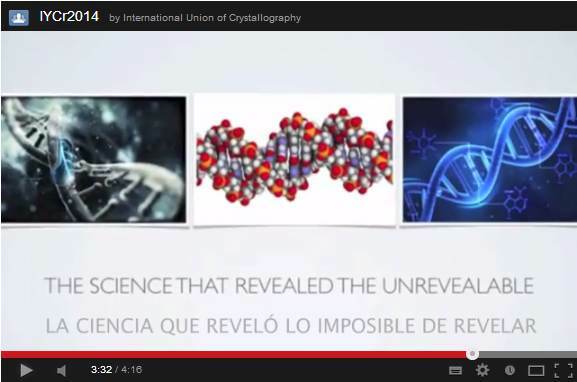 See the videos of the Crystallography Collection of the Ri Channel on the IYCr2014.org web site or visit the Ri web site. Read more about the award at http://www.rigb.org/about/news/winter-2014/european-science-tv-and-new-media-awards. 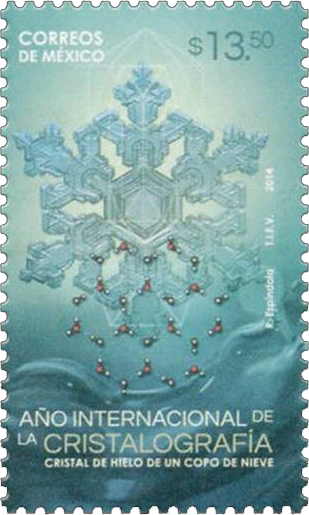 On 18 November 2014, the Mexican postal service Correos de Mexico issued a stamp to celebrate the International Year of Crystallography. The stamps will have a circulation of 75,000 units. The IUCr-UNESCO OpenLab Turkey 2, organized in collaboration with PANalytical BV, Atomika Teknik, UNAM, the National Nanotechnology Research Center at Bilkent University in Ankara and the Turkish Crystallographic Association will be held in Ankara from 19 to 22 January 2015. The article "IYCr2014: Spreading the Word About Crystallography in an International Year" by Brian McMahon and Michele Zema (IUCr) will be discussed online on 24 to 26 November during the 2014 Fall Newsletter virtual conference of the DivCHED CCCE of the American Chemical Society. The full article is available here. To take part in the online discussion you need to set up a free account at http://confchem.ccce.divched.org/2014FallCCCENL. 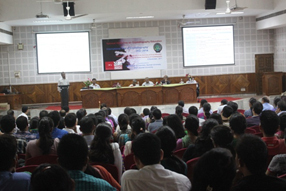 A National Workshop on Crystallography Education sponsored by the International Union of Crystallography (IUCr) and Department of Biotechnology (DBT-Northeast) was organised at Gauhati University on November 8, 2014. Prof. Gautam R. Desiraju (Former IUCr President and IISc, Bangalore) took the initiative by encouraging us to organize an event specifically in the North-East region of India where the field of crystallography has not developed so far compared to the rest of the country. The purpose of organizing this workshop was to celebrate the centenary year of X-ray crystallography and popularize the subject among the students and young researchers as part of IYCr activities. Click here to read a comment by Gautam Desiraju and a report by Ranjit Thakuria. We are very pleased with the many submissions to the IYCr2014 crystal growing competition received in the last week. This has caused some technical problems, either due to browser incompatibilities or network problems. Therefore the deadline has been extended to 22 November 2014. Before submitting your entry, please read the instructions and important notice at http://www.iycr2014.org/participate/crystal-growing-competition. "It is particularly fitting that a crystallographer should be so recognised during the International Year of Crystallography" is stated on the CODATA web site. 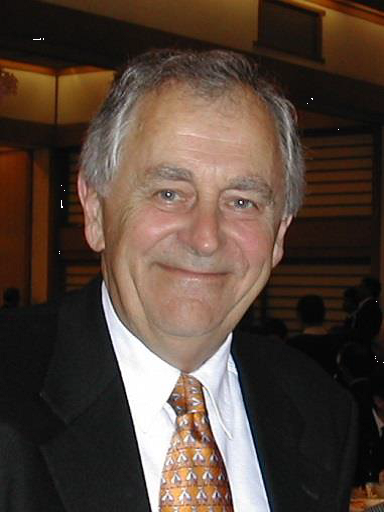 Indeed, the CODATA Prize, a major biennial award which acknowledges outstanding achievement in the world of scientific and technical data, has been awarded to Professor Sydney Hall, who devised a universal self-defining text archive and retrieval (STAR) file format that evolved into the Crystallographic Information Framework (CIF), a momentous contribution in the area of data characterisation, and well known to structural chemists and biologists in particular as both a data and publications standard. Read more on the IUCr or CODATA web site. 39 students from Colombia and Venezuela, as well as from Bolivia and Costa Rica, and 10 lecturers are ready for the kick-off of the IUCr-UNESCO OpenLab Colombia (Bucaramanga, 27-31 October) organized with the partnership of Rigaku and DECTRIS. At the same time, due to unforeseen circumstances, we inform that the OpenLab Turkey in partnership with PANalytical has been cancelled. The postponement of the event is presently under discussion. The first event to celebrate IYCr2014 in Benin will be held the University Campus of Abomey-Calavi on 12-14 November 2014 on the theme "Crystallography at the service of humanity: Issues and Challenges for the Future". The event is part of the "Journées Scientifiques sur la Cristallographie et Applications" organized by the the Section of Benin of the West African Chemical Society (Société Ouest-Africaine de Chimie, S.O.A.CHIM.). 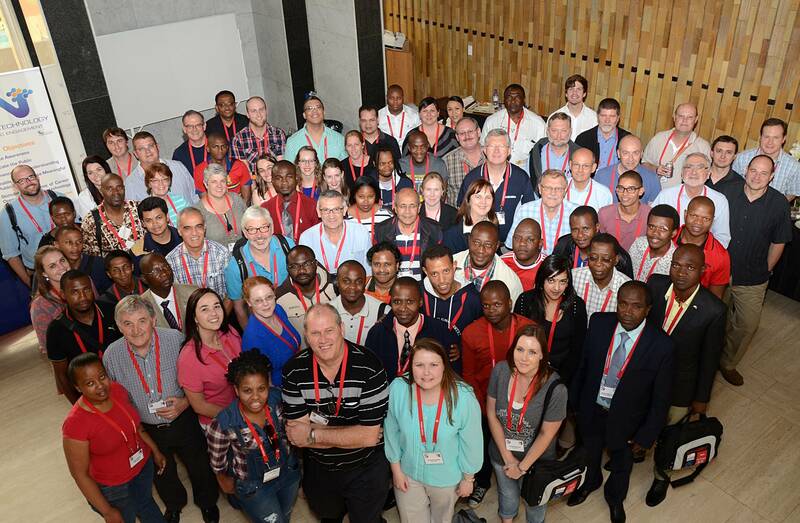 More than 100 senior researchers, early career researchers post-doctoral fellows and students representing more than 40 research groups from 32 universities and more than 20 countries attended the IYCr2014 Pan African Summit meeting in Bloemfontein, South Africa, 15-17 October 2014. It provided the opportunity to consider, discuss and review the status of education and research on the broadly defined discipline of Crystallography in countries in the region. A full report and a final declaration signed by the attendees will be available soon. 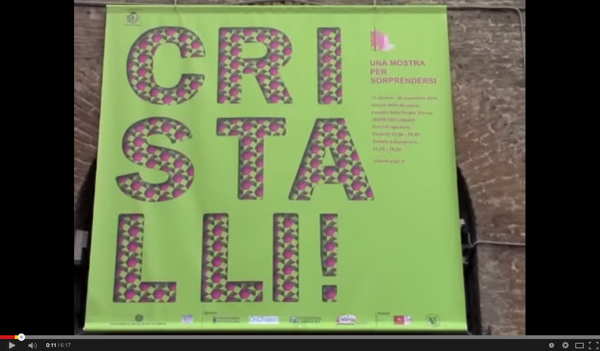 The exhibition CRISTALLI! was opened in Parma (Italy) on Saturday, 11 October, reaching one thousand visits over the first weekend. All kinds of crystals are on display, from amazing crystals of sugar weighing more than 0.5 kg to meteorites, minerals, shells and a silicon single crystal of 250 kg grown by the Czochralski method, immediately nicknamed 'the rocket'. A giant model of NaCl made of glittering balls and sticks is the kids' favourite. The exhibit will be opened till 30 November and over 2000 students from schools have already registered to visit it. Click on the thumbnail to watch a video about the exhibition. Due to the tragic events occurred last September in Algeria, when a French citizen was kidnapped and murdered, the IUCr-UNESCO OpenLab Algeria, organized in partnership with Bruker France, will be postponed to 2015. In fact, the French government decided not to give permission to their nationals to visit Algeria for the time being. The new dates of the OpenLab will be communicated as soon as possible. Although such risks have almost disappeared from big cities like Constantine, we understand the concerns of the French authorities and look forward to a successful OpenLab in Constantine in a few months time. Registrations are open for the IUCr-UNESCO OpenLab Hong Kong which will be held at the HKUST Campus from 3 to 7 December 2014. The main partner of this OpenLab are Agilent Technologies and OlexSys. The OpenLab HK offers an opportunity to provide impetus to develop the science and its practice in some of the less developed countries of the Asian region. Students from HK, Thailand, Malaysia, Indonesia and Philippines already applied. Deadline for registration is 31 October. Participation is at no cost, however a charge of US$300 is necessary as a Residential Fee for a single room on the HKUST campus for 6 nights (2 to 7 December). Some bursaries are available to subsidise the costs of accommodation and, where possible, travel. "Through this letter, we request the IUCr and UNESCO to initiate actions to promote regional scientific collaboration including the holding of training workshops, encouraging the mobility of researchers within the region, promoting joint research projects, leveraging national bodies and institutions for financial support and facilitating regional conferences on the subject of X-ray crystallography and its applications in Latin America. We also request the IUCr to facilitate the establishment of a Latin American IYCr Cooperation Fund." Read the full summit declaration signed by all participants in the Latin America Summit meeting from the region. All the IYCr declarations are collected at http://www.iycr2014.org/declarations. Registrations are open for the IUCr-UNESCO OpenLab Turkey to be held in Ankara from 3 to 6 November 2014. The main partner of this OpenLab is PANalytical. The OpenLab will deal with powder diffraction theory, data collection and treatment and will have a special focus on applications in the field of cultural heritage. Gilberto Artioli and one delegate from the company will hold the lecturing and tutorials. Deadline for registration is 27 October. Participation is at no cost. Some bursaries are available to subsidise the costs of accommodation and, where possible, travel. 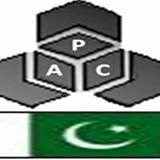 Following the success of the South Asian IYCr Summit meeting, held in Karachi on 28-30 April, the Pakistan Association of Crystallography (PAC) was founded and accepted as a new member of the IUCr at the 23rd IUCr Congress and General Assembly in Montreal. The first formal meeting of the PAC will be held on Thursday, October 9 at the FC College, Lahore, as part of the conference "Emerging Trends in Life Sciences for Sustainable Development”. The meeting will feature a plenary lecture by Prof Samar Hasnain, Editor-in-Chief of the IUCr journals. The IUCr-UNESCO Latin American Summit took place in Campinas, Brazil from 22 to 24 September with support by Funding Agencies CNPq, CAPES, and FAPESP, sponsorship by Molecular Dimensions, Bruker, NanoTemper, Agilent, GE Healthcare, Rigaku/Dairix, FORMULATRIX, astex, ttplabtech, and INCOATEC, and Institutional Partnerships with CNPEM, LNBio, LNLS, ABCr, and IFSC. "I discovered a great new world of possibilities"
Lorena M.: ”The course […] was a very good experience." Lisandro O.: “As student of the course I can tell you that the experience was really rewarding. Everything was perfect and one could feel that nothing was done at random. I really enjoyed being part of it." Ivana A.: “I enjoyed the OpenLab much [more] than I had thought in the beginning. [...] I discovered a great new world of possibilities, and I realized that there are many things that I can do and I did not know." Guzmán P.: “It also was a great deal to have let everyone measure their own crystals on a diffractometer which was installed just one week before the OpenLab." The latest issue of the Bruker FIRST Newsletter features an article on the IYCr2014 OpenLab Uruguay. Read the testimonials of some of the students who participated in this event. 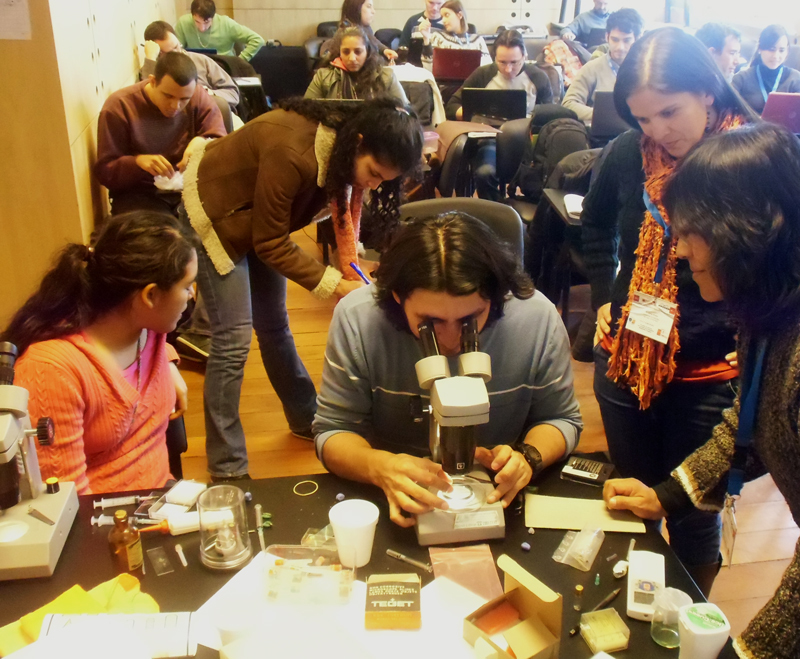 The IUCr-UNESCO OpenLab Uruguay was successfully held in Montevideo on 23-31 July 2014 in partnership with Bruker. Click here to read a full report by Leopoldo Suescun, local organizer of the event. Agência FAPESP – A group of 110 researchers from nine Latin American countries met between 22 and 24 September at the National Center for Research in Energy and Materials (CNPEM), in Campinas, to debate about research in biological crystallography - area dedicated to the study of protein crystals to understand biological processes, unveil the emergence and progression of diseases and develop new drugs. They participated in the Latin American Summit Meeting on Biological Crystallography and Complementary Methods, the main Latin American scientific event in the calendar of celebrations for the International Year of Crystallography (IYCr2014). The meeting was sponsored by the United Nations Educational, Scientific and Cultural Organization (UNESCO) and the International Union of Crystallography (IUCr). The IUCr-UNESCO OpenFactory brought together 20 young scientists from 15 different countries in an intensive and stimulating training programme in theoretical and practical aspects of X-ray crystallography and small-angle X-ray scattering. The event took place in Darmstadt and Grenoble, and was sponsored by three independent companies, STOE, DECTRIS and Xenocs. To celebrate the International Year of Crystallography 2014, the FEBS Journal, one of the premier venues for publishing the results of biochemistry-related research, put together a thematic Special Issue devoted to crystallography. This Special Issue contains six invited reviews and 19 invited original contributions covering a wide range of subjects in the area of history, methods, and new results in macromolecular crystallography. 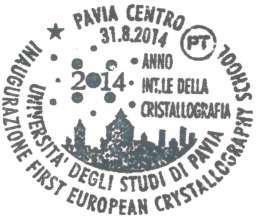 On 31 August 2014, the Italian postal service Poste Italiane issued a special postmark to mark the inauguration of the First European Crystallography School at the Univeristy of Pavia, and to celebrate the International Year of Crystallography. Meanwhile, the Korean Crystallographic Association has been involved in the design of three commemorative stamps to celebratethe International Year. Visit the postage stamps section of this website for further details on these and the many other stamp issues during the International Year. The IYCr2014 STOE-DECTRIS-Xenocs OpenFactory is currently taking place. On Friday 19 September, 11:00 am, Prof G.R. Desiraju (IIS Bangalore, India), Immediate Past President of the IUCr, will give a talk entitled "100 years of crystallography as seen through 15 small molecule crystal structures". Forty-five students attended the IUCr-UNESCO OpenLab Turkey, organized in partnership with Agilent Technologies. The workshop took place at the Dokuz Eylül University at İzmir in Turkey. 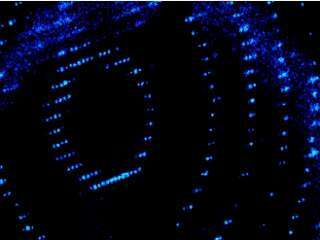 It focused on single-crystal structure determination by X-ray diffraction and aimed to cover all steps from mounting the crystal to reporting the results. The programme consisted of lectures and practical sessions; the lectures dealt with crystal symmetry, X-ray diffraction from a crystal, phase problem, structure solution and refinement. 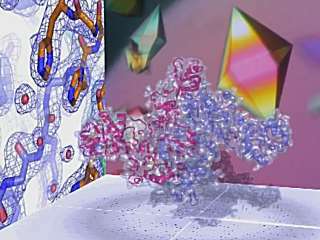 The video Diving into the heart of the molecules of life, prepared by researchers at the Institut de Biologie Moléculaire et Cellulaire, Strasbourg, France, and available from YouTube in both English and French language versions, provides a detailed and informative introduction to the practice of protein crystallography. Colleagues are invited to prepare versions of this video in other languages. 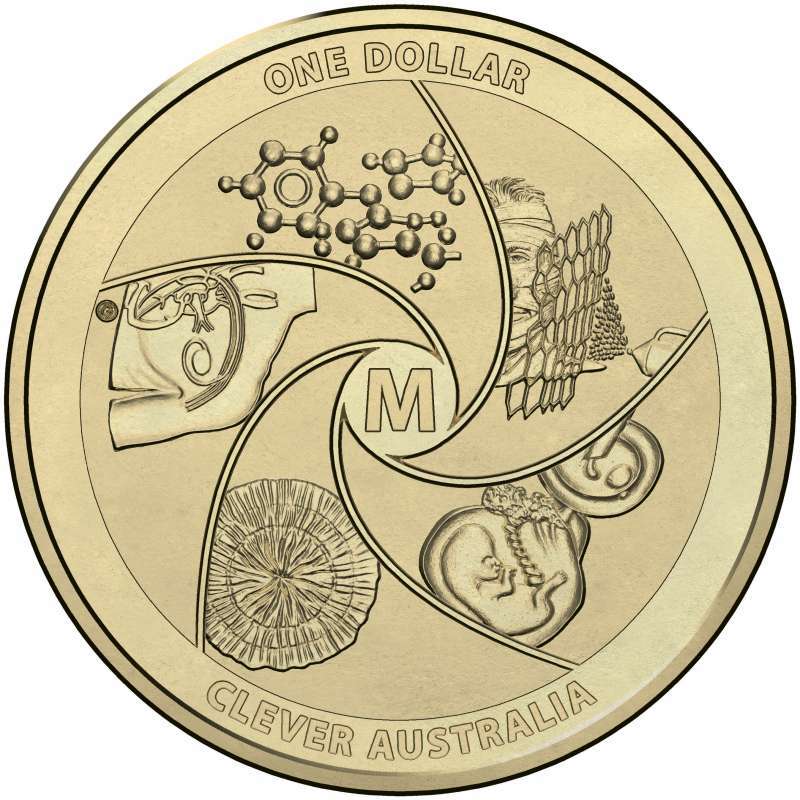 In celebration of Australia’s National Science Week, we are going to be embarking on a social media promotional program next week focused on the inventions featured on the coin and will be sure to tag IYCr2014! The winning entries in the Agilent/IUCr photo competition Crystallography in Everyday Life were announced at the IUCr Congress in Montreal. 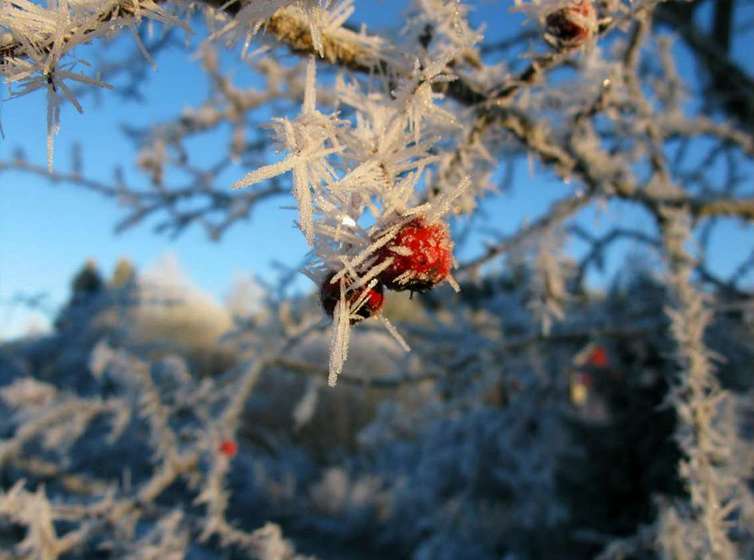 Two USD 1000 travel bursaries were awarded to: Mélanie Meyer for her witty image When baking meets crystallography; and Jens Preben Morth for IceRowan, showing ice crystals forming on rowan berries. These, along with the most notable other submissions from the 254 entries received for the competition, can be seen in a special section of the the IYCr2014 website. 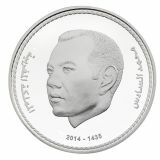 Following a proposal by Morocco and the subsequent proclamation by the United Nations of 2014 as the International Year of Crystallography, the National Central Bank of Morocco, Bank Al-Maghrib, has engraved a commemorative silver medal which was released on 7 August 2014. 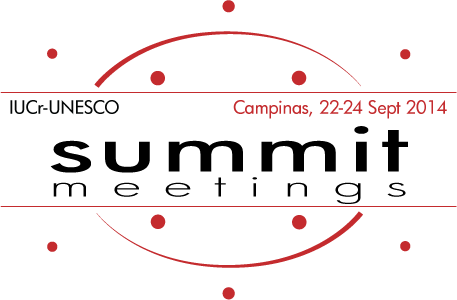 Cristalizado, the wine of the International Year of Crystallography 2014, has been created by Carrau wineries and Professors Francisco Carrau and Eduardo Boido of the Facultad de Química, Universidad de la República in Montevideo (Uruguay). This Tannat Rosé wine has been processed in such a way that small natural crystals of potassium bitartrate (a natural component of grapes and wine) were allowed to form in the bottle. To celebrate IYCr2014 and to accentuate a series of important anniversaries, including “The Jan Czochralski Year 2013”, the Committee of Crystallography in Poland has organized the 1st National Crystallography Olympiad. The Finals were held in Wroclaw on June 25, 2014, in connection with the Annual Polish Crystallographic Meeting (“Crystallographic Conversations”). Twenty students and six lecturers are attending the IUCr-UNESCO OpenLab Uruguay, organized in partnership with Bruker. The OpenLab is being held at the Facultad de Química, Universidad de la República, Montevideo. It started on Wednesday 23 July with lectures on symmetry, space groups, International Table for Crystallography and X-ray diffraction, and hands-on session on crystal mounting and single-crystal XRD. More lectures and tutorials are scheduled until Thursday 31 July. Lecturers are Leopoldo Suescun (chair of the organizing committee), Ricardo Faccio and Alvaro W. Mombrú from local university, Javier Ellena from USP-Sao Carlos, Sao Paulo, Brasil, together with Bruce Noll (Bruker) and Claude Lecomte (IUCr). A paperback edition of the Online Dictionary of Crystallography has been released and will be available at the IUCr booth in Montreal at the special price of 16 CAD (11 EUR, 9 GBP). To reserve your copy for collection at the Congress, please send us an email (reservedict@iucr.org). 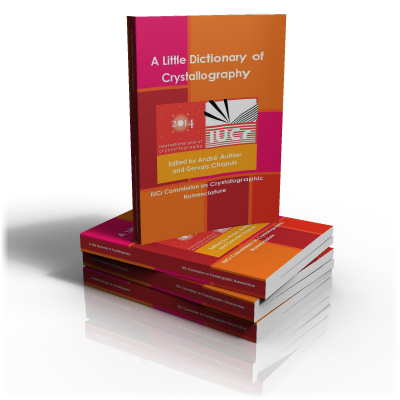 The book is produced by the IUCr Commission on Crystallographic Nomenclature as a contribution to the outreach activities of IYCr2014, and is edited by André Authier and Gervais Chapuis. 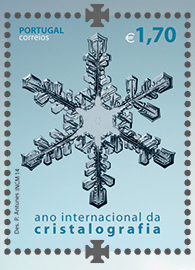 The Portugal correos has released the issue "Ano Internacional da Cristalografia", consisting of five stamps and a souvenir sheet, which illustrate crystallography in the areas of geology, physics, mathematics, chemistry and biology. Visit the Postage stamps web page to see the entire collection of stamps commemorating IYCr2014. 5th Meeting "X-ray and other techniques in investigations of the objects of cultural heritage"
The Milestones are a series of specially written articles, published by Nature Publishing Group, highlighting the most influential developments towards understanding and using fundamental properties of light and its basic units, photons. Nature Milestones in Crystallography also includes a Collection of relevant articles, an online-only Library of papers and reviews from Nature Publishing Group and a milestones timeline. Moreover, two articles from the International Union of Crystallography describe the role of the Union and its journals for the crystallographic community and the activities and long-term objectives for the International Year of Crystallography. The IYCr2014 brochure "Crystallography matters!" is now available in Urdu language, thanks to the translation work done by Dr Sammer Yousuf (Karachi, Pakistan) and Dr Niyaz A. Mir (Bangalore, India). Download the brochure in any of the sixteen languages now available at the Promotional material page and distribute it to your community. If you would like to volunteer to translate the text of this booklet into your own language, please contact iycr2014@iucr.org. More than 20 students are attending the IUCr-UNESCO OpenLab Cambodia, organized in partnership with Rigaku Corporation. The workshop is about powder diffraction technique and applications and is making use of the Rigaku Miniflex diffractometer installed at the Institute of Technology of Cambodia. What are the best conditions for growing the biggest crystals? The Royal Society of Chemistry and the International Union of Crystallography announce the Global Experiment 2014 "The art of crystallisation" to try to find the best conditions for growing crystals. Collaborate with thousands of students from around the world. Follow the instructions to grow your own crystals, analyse the results and post your local data. The Global Experiment 2014 is aimed at students aged between 7 and 16 years, working in consultation with their teachers. It will remain open for the 2014-2015 academic year. The IUCr-UNESCO OpenLab Turkey, an initiative in partnership with Agilent Technologies, is being held at the Department of Physics of Dokuz Eylül University, Izmir on 1 to 5 September 2014. Registration are now open at http://iycropenlabturkey.org. Candidates are young scientists from Turkey and all the countries located in the Balkans and the Middle East. Registration deadline is 1 August. The IUCr, together with STOE, DECTRIS and Xenocs have now announced the selected delegates for the IUCr-UNESCO OpenFactory in Darmstadt and Grenoble. Delegates are young scientists, from PhD students to Assistant Professors and represent nineteen different countries. Click on Read more for the full press release and the list of participants. The IYCr2014 brochure "Crystallography matters" is now available in 14 languages, after two new versions have been added to the collection. The Spanish edition was translated by Leopoldo Suescun with the contributions of Gabriela Aurelio, Juan Pablo Bolletta, Marta Bunster, Fernando Colombo, Silvia Espinoza, Valeria Fuertes, Pablo Gauna, María Alejandra Miranda, Rodolfo Moreno-Fuquen, Graciela Punte, Pablo Rossi, Fabiola Sanjuan-Szklarz, Jose R. Vega. Thanks go to Iris Torriani for handling the Portuguese translation. The Portuguese (Brazilian) and Japanese versions are also ready and will be available soon for download. The IUCr-UNESCO travelling laboratory in Morocco, organized in partnership with Bruker France, and with the support of the University of El Jadida and the Faculty of Science of El Jadida, made its second stop in El Jadida on 9 to 11 June. 34 PhD and postdoc students from El Jadida, Casablanca, Fez, Tanger, Agadir and Meknès attended the school, which took advantage of the Bruker portable single-crystal and powder diffractometers. The next stop will be in Agadir on 16-20 June. 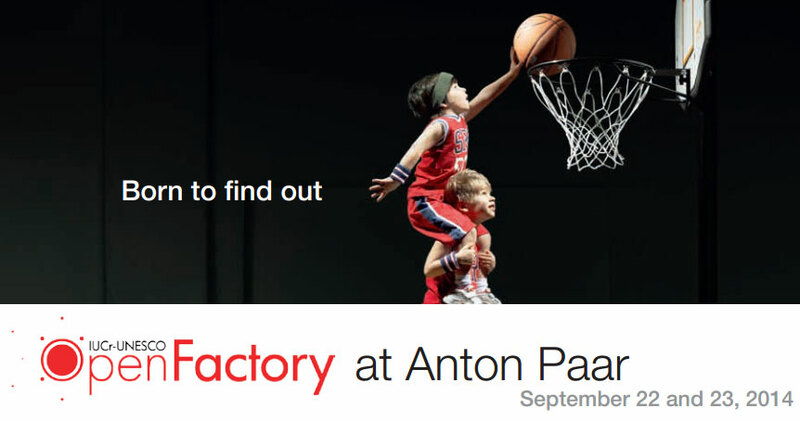 Registrations are now open to attend the IYCr2014 OpenFactory at Anton Paar on 22 to 23 September. Details at the web page and on the invitation leaflet. 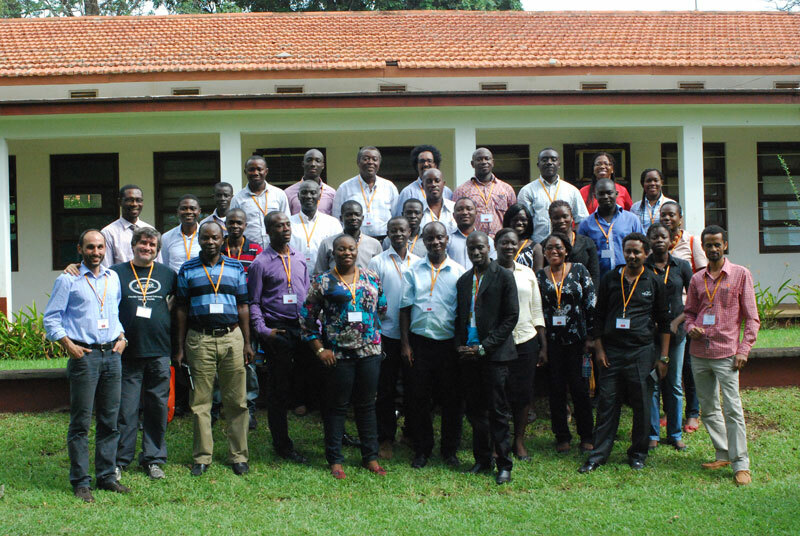 The OpenLab Ghana, an IUCr-UNESCO initiative in collaboration with PANalytical BV, F. Malawi Engineering Co. Ltd., and the Department of Physics at the University of Ghana in Accra, Ghana is currently ongoing. This OpenLab provides crystallographic training in X-ray Powder Diffraction and is fully subscribed with attendees coming from Ghana but also from neighboring countries, like Liberia and Nigeria. The lecturers are Prof. Gilberto Artioli (Università di Padova) and Dr. Marco Sommariva from PANalytical. On 3 June 2014, the Steering Committee of the Malaysian Crystallographic Association announced Government approval for the establishment of the Pertubuhan Kristalografi Malaysia. The act signifies Malaysia’s intention to participate formally in the IUCr, an on-going project led by the Malaysian Crystallographic Society under the guidance of Dr Nadiah Halim of the University of Malaysia. All Malaysian crystallographers, home and abroad, are invited to register their interest in joining the Society by sending an email to Dr Low Yun Yee (yylow@um.edu.my), interim Secretary. Plans for an Annual General Meeting later in the year are being made where elections will be held for Office bearers and Committee members. Read the announcement on the IUCr web site. The University of Malaya (UM) Chemical Crystallography Symposium 2014 was held recently in Kuala Lumpur, being the first formal commemoration of the IYCr2014 in Malaysia. For the fourteenth edition of the Belgian Crystal Growing Competition, alum was chosen as material for growing single crystals. The crystallization experiments took place over a period of four weeks. In total 94 schools registered for the competition and 265 crystals were submitted for judging. In addition there was a special competition for growing single crystals of alum, starting from a green seed crystal obtained by adding a food colorant to the initial crystallization solution. The winners were announced during the prize awarding ceremony on 21 May 2014 in the Academy Palace in Brussels. For each age category three prices were awarded: Best Crystal with Green Seed, Second Prize and First Prize. As well as a beautiful trophy, the winners received glassware, books and videos. For this special IYCr2014 edition of the competition all participants received a nice T-shirt as a souvenir. 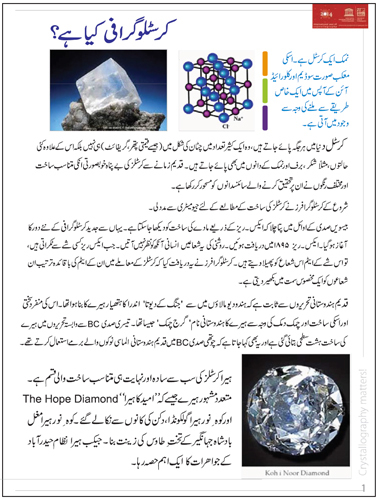 A new small brochure, with nice images and simple descriptions, has been released to explain to school children what crystallography is and why the United Nations proclaimed 2014 the International Year of Crystallography. Download it here or visit the IYCr2014 promotional page. A team from the Colegio Santo Domingo in Oviedo has won the Spanish 'Crystallization in Schools' Competition with a project entitled 'The Crystallizing Adventure'. The students from Oviedo performed a series of crystallization experiments using different salts and food colouring powders to grow crystals of extraordinary beauty, plenty of different colours and enormous size! A travelling laboratory is starting its tour in Morocco on Monday, 26 May. Three stops are scheduled, the first in Rabat (26-30 May), then El Jadida (9-11 June) and finally Agadir (16-20 June). The workshops will be held for students from Morocco and abroad. The IUCr-UNESCO OpenLab Morocco in partnership with Bruker France will make use of portable single-crystal and powder diffractometers. Lecturers from the IUCr, Bruker France and from local Universities will hold the workshops. The "Learn about crystallography through watching" page on the IYCr2014 web site now includes links to the IYCr2014 YouTube playlist, to the Royal Institution Crystallography Collection, and to a growing number of educational and historical videos. Let us know of any videos on the web that you would recommend for learning more about crystallography by sending a message to iycr2014@iucr.org or posting a comment on facebook. 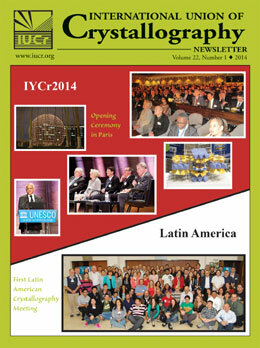 Seven pages are dedicated to IYCr2014 in the new issue of IUCr Newsletter now available. Also read exciting news about the formation of the Latin American Crystallographic Association (LACA), which aims to become a Regional Associate of the IUCr. Other features: IUCr journal news, including information about special issues and participation in Kudos, a service to help authors maximize the impact of their publications; Crystallography in North America; a review of André Authier's "Early Days of X-ray Crystallography" by Joel Bernstein; meeting reports; and further information about the 23rd IUCr Congress. To start your free subscription to this quarterly digital publication, please go to http://www.iucr.org/news/newsletter/request. 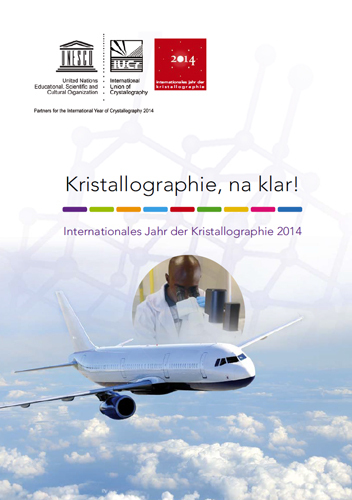 The IYCr2014 brochure "Crystallography matters" is now available in German. Thanks to Götz Schuck for the coordination and to all those who participated in the translation: Rico Berthold, Thomas Doert, Udo Heinemann, Frank Hoffmann, Ulrike Krug, Kevin Lamberts, Roy Lancaster, Hanna Lührs, Carola Müller and Susan Schorr. Today's Google Doodle celebrates Dorothy Hodgkin's birthday by incorporating her molecular model of penicillin, which is on display in the Science Museum in London. Dorothy, who was born in Egypt in 1910 and served as IUCr President from 1972 to 1975, won the Nobel Prize in Chemistry 50 years ago "for her determinations by X-ray techniques of the structures of important biochemical substances", which also included vitamin B12. Read biographical notes at http://www.iucr.org/people/nobel-prize/hodgkin and download a poster at http://www.iycr2014.org/about/promotional-materials. The Spanish national final of the Crystallization Competition in the School will be held at the headquarters of the Spanish National Research Council in Madrid on Saturday, 10th May. 40 teams, 120 students and 40 secondary school teachers from all Spain will participate in the contest. Congratulations to Graziano Lolli on winning the SCANZ prize in the Australian satellite of the IYCr2014 "Crystallography in Everyday Life" photo competition. His photo "Romanesco broccoli" was voted #1 by the conference delegates of the Crystal29 conference in Queensland. Click on read more to see the photo. The main photo competition is open until 31 May and two USD 1000 bursaries, sponsored by Agilent Technologies, will be awarded to attend the IUCr Congress in Montreal in August 2014. Click here to submit your best photographs. Click on the thumbnails to enlarge the images and read the articles or visit the media coverage page. In the years 1887-1891, Max von Laue (1879-1960) attended Friedrich-Wilhelms-Gymnasium, now St. John’s Senior High School No. III (III LO im. św. Jana Kantego) in Poznań. To celebrate the International Year of Crystallography, a Memorial Plate has been unveiled on the façade of the school building on April, 11th. 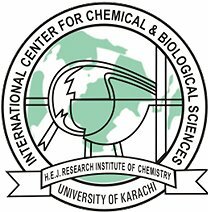 The first of the IYCr2014 major events opened today at the International Center for Chemical and Biological Sciences (ICCBS), Karachi, Pakistan with 22 nationalities represented. See a photo gallery of the event. The IUCr-UNESCO OpenLab Pakistan, in partnership with Bruker, will open at the ICCBS on Wednesday, 30 April. The Australian Nuclear Science & Technology Organisation (ANSTO), supporter of IYCr2014, has released a promotional video to celebrate crystallography and the International Year. Click on "Read more" to watch it. The IYCr2014 brochure "Crystallography matters" is now available in Macedonian. The document was translated by Gligor Jovanovski and edited by Panče Naumov. Visit the "Promotional material" page to download it. This image, designed by Richard Frederickson and Joseph Meyer (Scientific Publications, Graphics & Media, Leidos Biomedical Research, Inc.), was originally published in a review by M. Jaskolski, Z. Dauter and A. Wlodawer, titled “A brief history of macromolecular crystallography, illustrated by a family tree and its Nobel fruits” (FEBS Journal, Accepted manuscript online: 3 Apr 2014, DOI: 10.1111/febs.12796). See the image and read a description here. Used by permission of the Publisher, John Wiley & Sons, Inc. 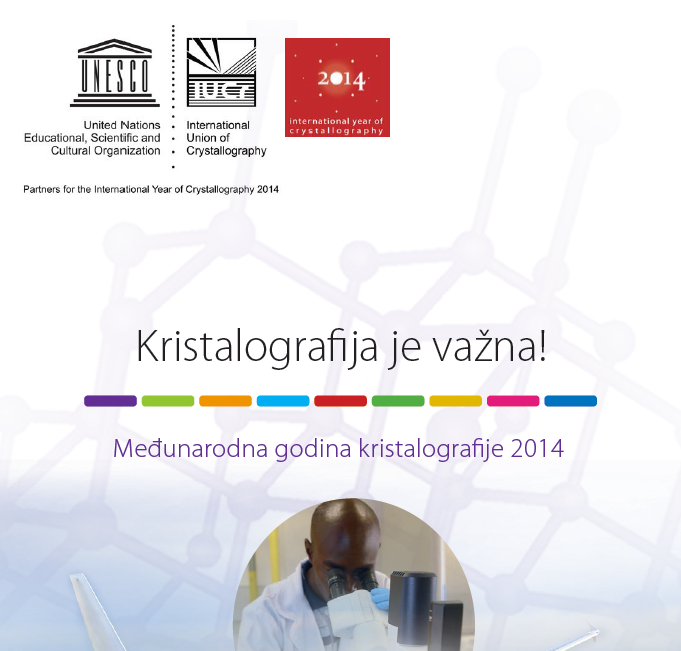 The IYCr2014 brochure "Crystallography matters" is now available in Croatian. Thanks to Stanko Popovic, Darko Tibljas and Vladimir Stilinovic, members of the Croatian Crystallographic Association, for translating the document. Other languages (Macedonian, German) to be added soon. Today a Memorial Bronze Plate commemorating the school years of Max von Laue in Poznan (1887-1891) is being unveiled. The function will be followed by the "Laue Symposium". See the programme of the event here. The IYCr2014 brochure "Crystallography matters!" is now available in Thai. Thanks to the National Science and Technology Development Agency (NSTDA) for their excellent job on the translation and layouting of the booklet. HRH Princess Maha Chakri Sirindhorn was presented with a copy of the brochure on her presiding over the opening ceremony of NSTDA Annual Conference 2014 on March 31, 2014 at Thailand Science Park, Pathumtani. Exhibitions, crystal growing competitions, the first European Crystallography School, and much more. 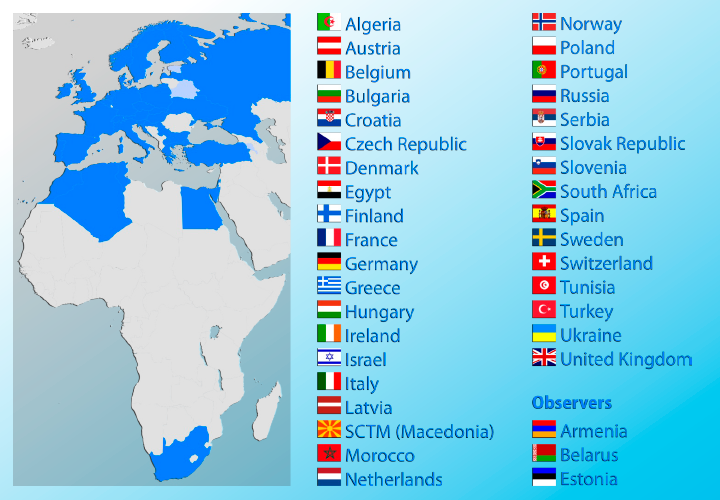 Discover all the events for IYCr2014 in the ECA countries at www.iycr2014.eu. 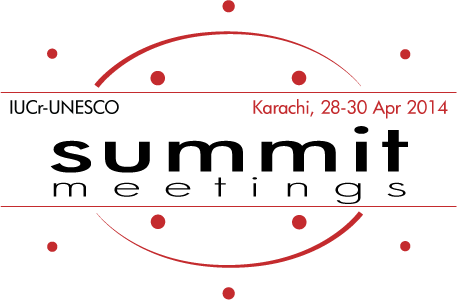 On April 28, 2014, the IUCr-UNESCO OpenLab Pakistan, in partnership with Bruker, and the IYCr2014 South Asia Summit Meeting "Vistas in structural chemistry" will be both opened at the International Center for Chemical and Biological Sciences (ICCBS) in Karachi, Pakistan. Visit the web pages of these two major IYCr2014 events following the links above to find out all details and programmes. All photographs submitted to the IYCr2014 photo competition "Crystallography in Everyday Life" by 7 April will be eligible for the 500 AUD (Australian Dollars) prize, sponsored by the Society of Crystallographers of Australia and New Zealand (SCANZ). All entries submitted by this date will also be considered for the two final prizes of 1000 USD each to attend the IUCr Congress in Montreal, sponsored by Agilent Technologies (closing date: 31 May). 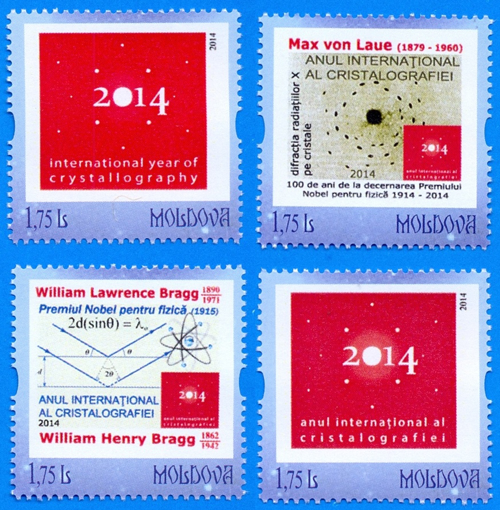 The Bureau of Personalized Stamps of Moldova Post has issued 4 personalized stamps to celebrate the International Year of Crystallography 2014. The stamps were designed by Gheorghe Plugaru and show: (1) IYCr2014 Logo in English Language; (2) IYCr2014 Logo in Romanian Language; (3) celebrating the Centenary of Nobel Prize Laureate Max von Laue; (4) celebrating the Nobel Prize Laureates William L. Bragg and William H. Bragg. 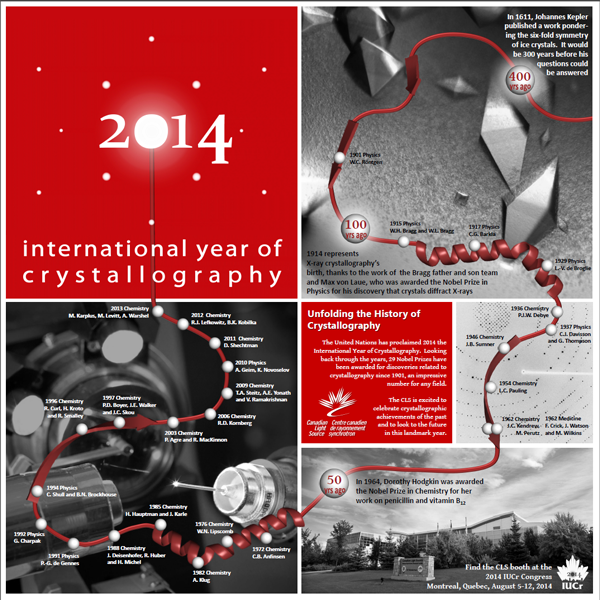 The Canadian Macromolecular Crystallographic Facility at the Canadian Light Source (CLS), one of the large-scale facilities supporting IYCr2014, celebrates IYCr2014 with a poster on the crystallographic achievements of the past to look to the future in this landmark year. 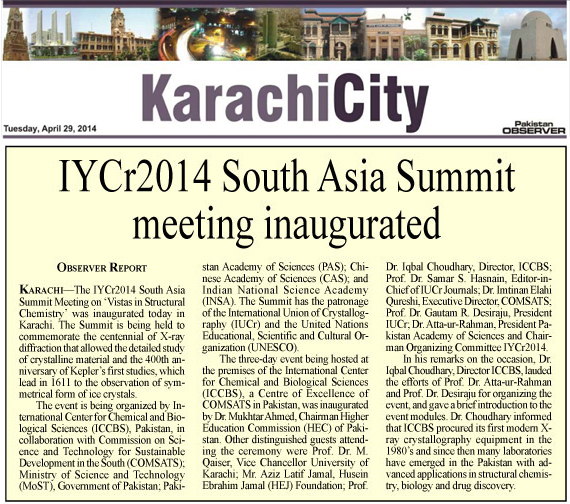 The IYCr2014 South Asian Summit Meeting on "Vistas in Structural Chemistry" will be held between 28 and 30 April, 2014 at the International Center for Chemical and Biological Sciences, University of Karachi, Karachi, Pakistan. The programme features 8 sessions, including Inauguration Ceremony, Metal-Organic Framework Compounds (MOF), Crystal Engineering and Generic Pharmaceuticals, Chemistry-Biology Interface and Drug Discovery and Designing, Crystallography and complementary methods, Summit Lecture, IUCr: Union & Journals, Summit Concluding Session as well as 4 panel discussions. 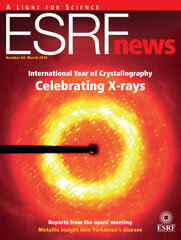 ESRFnews (March 2014 issue) features an Editorial by Sine Larsen (IUCr President 2008–2011 and former ESRF research director), focussing on the impact of synchrotron radiation in the development of crystallography, and an entire section about IYCr2014: IUCr President Gautam Desiraju talks about the changing role of the IUCr, synchrotrons and the importance of emerging economies in his interview "Union keeps crystals in check". Subscribe to ESRFnews to receive a link to the digital edition. A number of IUCr-UNESCO OpenLabs already started their organization activities: Pakistan and Uruguay (Bruker), Argentina (Agilent), Ghana (PANalytical), Germany/France OpenFactory (STOE-Dectris-Xenocs). Many more will be confirmed soon. The OpenLabs are aimed at allowing access to crystallographic knowledge and technology in all parts of the world and particularly to young scientists from the most disadvantaged regions, key for the fruitful development of science, and to open possibilities for conducting high-level research. More details, including information on how to apply to take part in any of these initiatives, are available at http://www.iycr2014.org/openlabs. Follow the International Year of Crystallography on facebook to get the latest news about events and initiatives, read articles, see videos and photos and stay involved! "DEVELOPED AND DEVELOPING NATIONS RECOGNIZE THAT INNOVATION IS KEY TO THEIR ECONOMIES. Connecting this with the discipline of crystallography may not seem immediately apparent, but during the past century, understanding the structure of matter has transformed industries and created new frontiers, from the design of new medicines and materials to assessing the mineral content of Mars. The future global economy will be determined by progress in cutting-edge fields." Read the Editorial of Prof Gautam R. Desiraju on Science magazine "Crystallography at 100" special issue. It is now possible to order IYCr2014 T shirts (and polo shirts, sweatshirts, caps, bags, ...). Visit the new "merchandise" section. 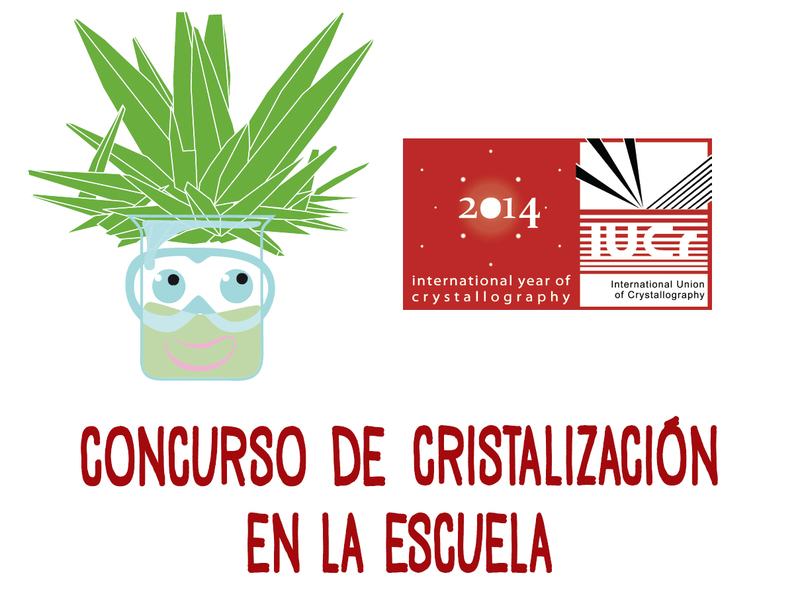 To celebrate IYCr2014, a worldwide crystal-growing competition open to all schoolchildren is launched by the IUCr. Students of primary or secondary schools are invited to grow their own crystals and convey their experiences through videos or essays. Closing date for submissions is 15 November 2014. A brand new video, created by Quidos for the International Year of Crystallography, has been released. Click on "Read more" to watch it. Applications to participate in the IUCr-UNESCO OpenFactory, organized in partnership with STOE-Dectris-Xenocs, are open. The event will be held in Grenoble/Darmstadt on 10-19 September 2014 and will be free of charge for participants. Candidates are young scientists, who are already knowledgeable about crystallography, but so far have less exposure to XRD. These scientists shall have the potential to become future thought-leaders for crystallography and application of XRD and X-ray scattering in their home country. The number of places available for this event is limited. Deadline for submitting the applications is 30 March 2014. Read the media coverage on The Hindu Business Line and Bangalore Mirror of the release function of the India Post commemorative stamp issue for the International Year of Crystallography at the Indian Institute of Science (IISc), Bangalore (India) on 30 January 2014. The video of the whole function is available here. UNESCO Regional Office for Science and Technology in Montevideo (Uruguay) has produced a video to launch IYCr2014 in Latin America and the Caribbean. 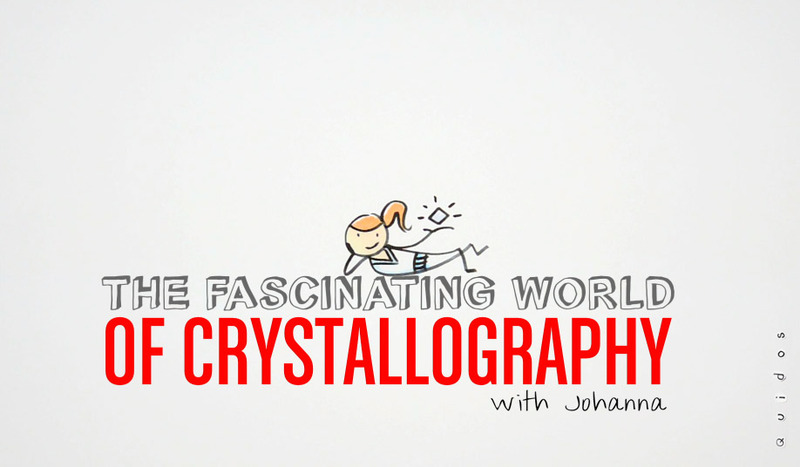 What is happening around the world in this International Year of Crystallography? 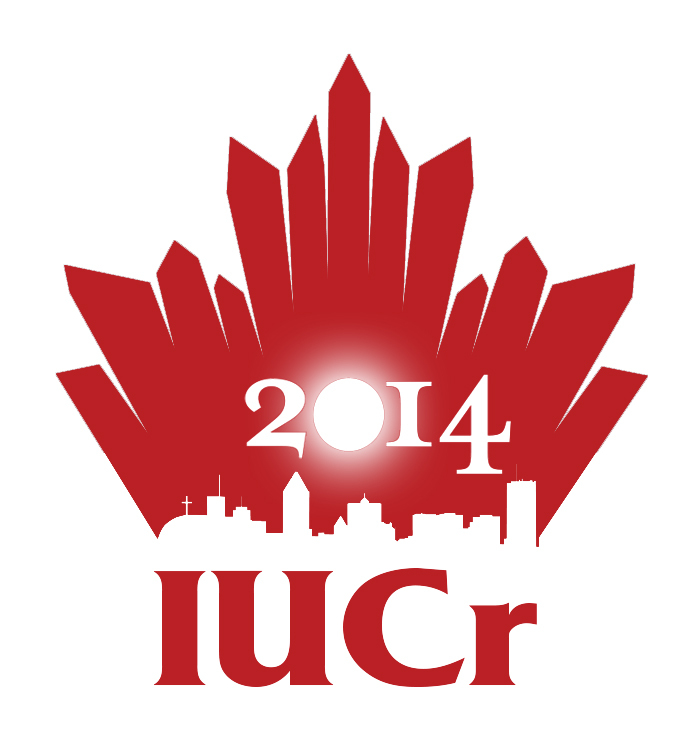 The call for abstracts for the 23rd IUCr Congress in Montreal is still open. Late Abstract Submission for Poster Presentation at a fee of $25 CAD per submission is open until 2 May 2014. A celebratory microsymposium on IYCr2014 will take place in the morning on Monday, August 11. Contributions on activities at global, regional, national or local levels to celebrate IYCr2014 and increase the awareness about crystallography are warmly welcomed. Please note that the limit of one abstract per submitter does not apply to educational sessions, including MS-86 (IYCr). The IYCr microsymposium in Montreal will be the forum for discussing about the initiatives, sharing ideas and experiences, and plan the legacy and the follow-up of this festival year. A new section dedicated to the commemorative postage stamps for IYCr2014 has been added. IYCr2014 has been formally launched with a press conference on 12 Dec 2013 and the Opening Ceremony at UNESCO on 20-21 Jan 2014. Read about the activities planned for the Year in the dedicated section on the latest issue of the IUCr Newsletter. Agilent Technologies Inc. (NYSE: A) today announced a global partnership with the International Union of Crystallography (IUCr) to support the International Year of Crystallography 2014, a 12-month program co-organized by the IUCr and the United Nations Educational, Scientific and Cultural Organization (UNESCO). The program includes international school visits, workshops, technology-sharing and a photo competition. "Crystallography dominates structural chemistry, but it has also made significant inroads into synthesis, as for example in crystal engineering, and into dynamics. One cannot conceive of modern chemistry without crystallography." says Prof G.R. 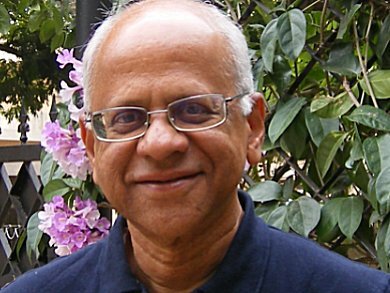 Desiraju, President of the IUCr, in his Editorial for Angewandte Chemie. 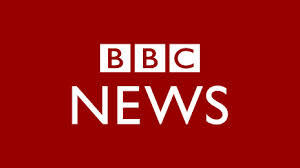 This and many other articles and reports are now available at the media coverage page. Press release from the United Nations News Centre in view of the official launch of IYCr2014 next week at UNESCO. 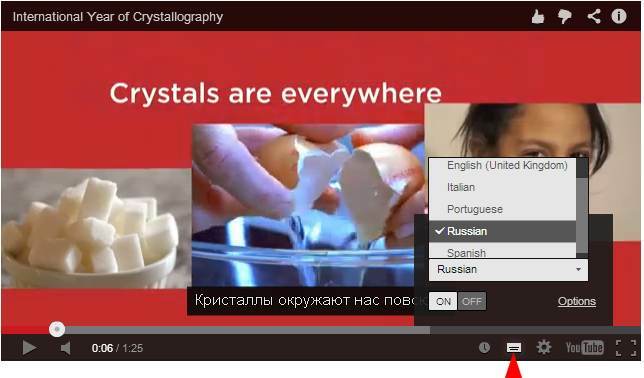 Subtitles are available for the IYCr2014 video "What crystallography can do for you" in English, Portuguese, Spanish, Russian and Italian. To activate them, after opening the video, click on the captions button (see figure; hold your mouse over the figure to enlarge it). Do you want to add the subtitles in your own language? 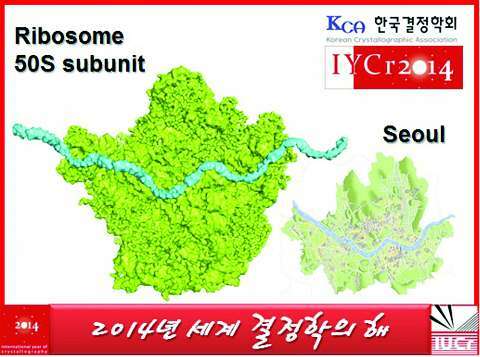 Download this text file, translate it and send it back to iycr2014@iucr.org. "The scientific journey into the molecule turns 100-years-old" states the magazine Time today. With the advent of crystallography — the science of how matter is arranged — we learned how to visualize molecules in 3D, helping us make everything from better medicines to stronger materials. Despite that huge advance, if you stopped someone in the street and asked them what crystallography was, chances are you would get a blank stare. To help raise awareness, and to celebrate a century of amazing discoveries, 2014 has been declared the International Year of Crystallography. The British Crystallographic Association have released a new British based website in light of the IYCr to provide information on crystallography suitable for a general audience, to advertise events and to highlight other resources. The website is being released to coincide with IYCr2014, but not aimed purely for this year, but to continue as a resource for many years to come. The website for the IYCr2014 activities in Germany has been launched. Professor Gautam Desiraju spoke to Dr. Vera Köster for ChemViews Magazine about scientists who inspired him, his hopes for the future, and chemistry research and education in India. As President of the International Union of Crystallography (IUCr) he also talks about plans for the upcoming International Year of Crystallography (IYCr2014). The 2014 Calendar of the Worldwide Protein Data Bank celebrates IYCr2014 with monthly illustrations of how X-ray crystallography enables our understanding of biology at the atomic level. The calendar, and the individual images used for each month in a format suitable for use as desktop wallpaper, can be downloaded from the wwPDB web site. The 2014 Calendar of the Indian Institute of Science (Bangalore, India) is entirely dedicated to IYCr2014. 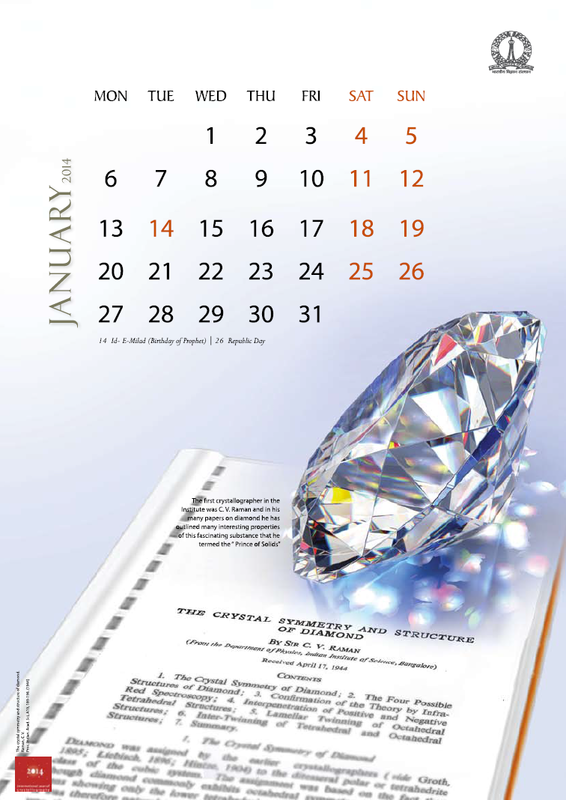 All figures in the calendar have been selected from crystallographic work that has actually been done in the Institute. You can download it here. Given the great success, the exhibition "L'enigma Escher" has been extended to 23 March 2014. Read here the press release, mentioning the connection of this event with the International Year of Crystallography (in Italian). 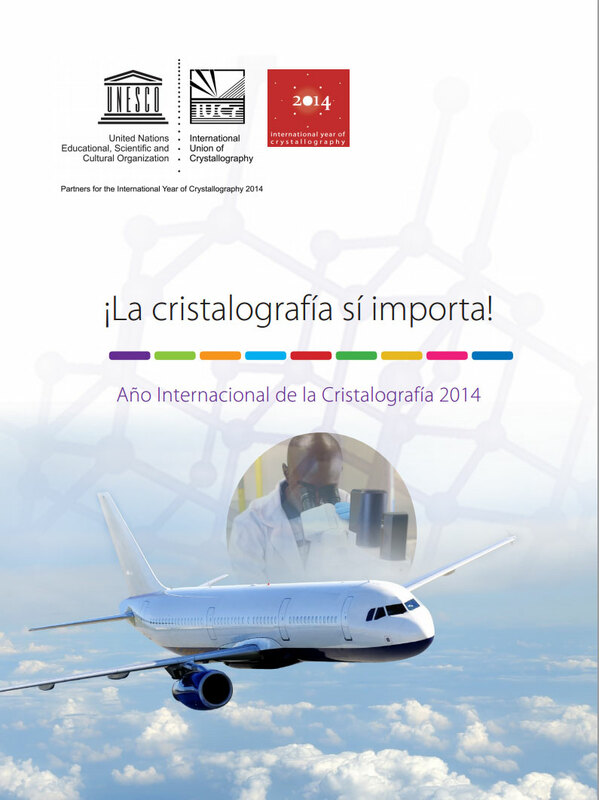 Great media coverage today on El País and BBC News of crystallography and IYCr2014. In an interview with Adam Rutherford of the BBC radio programme Inside Science, Professor Mike Glazer from Oxford University says he hopes the International Year of Crystallography will help bring the subject out of the shadows. Thank you to all those who participated in the Virtual Press Conference "What crystallography can do for you" on Thursday 12, 13:00hrs GMT. All resources are now available here, including the messages of the President of the IUCr, Prof Gautam R. Desiraju, the UNESCO Director General, Ms Irina Bokova and the science writer Georgina Ferry, and much more. 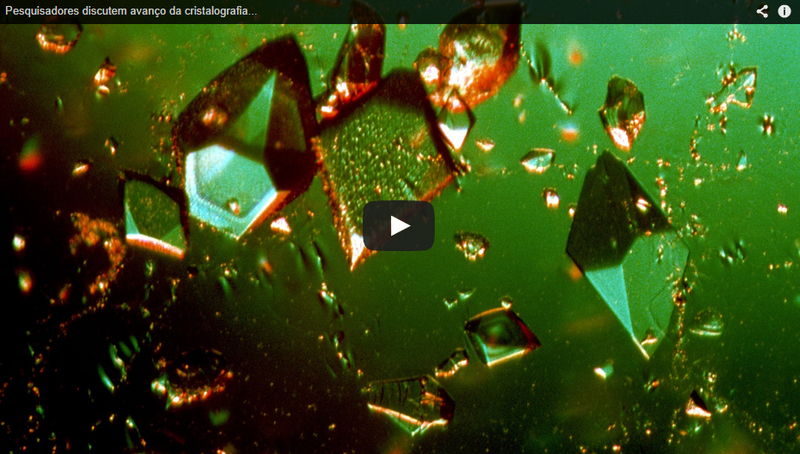 The official video launching the International Year of Crystallography has been released. Click here if you want to know more about it. 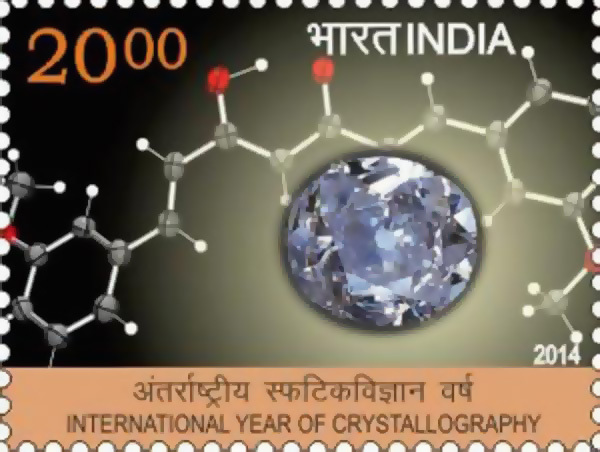 A postage stamp dedicated to the International Year of Crystallography will be issued by Slovak Post on 14 February 2014. The website for the IYCr2014 activities in Sweden has been launched. We are delighted to declare the IYCr2014-Agilent Photo Competition open! Submit stunning images that capture the spirit of crystallography in the places, objects and experiences of everyday life for the chance to win one of two USD 1000 bursaries, sponsored by Agilent Technologies, to attend the IUCr Congress in Montreal in August 2014. 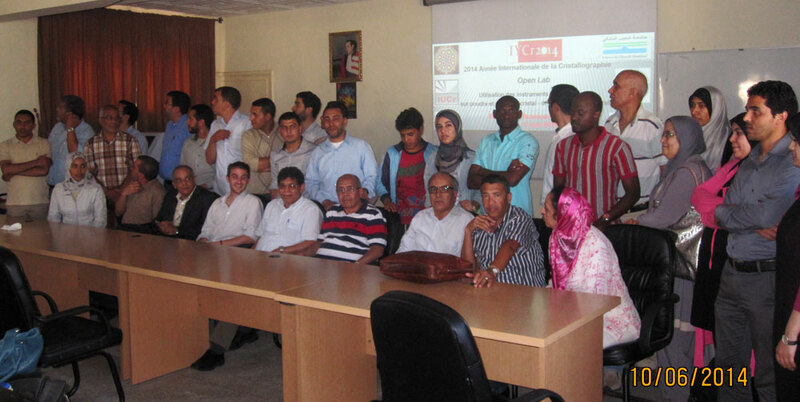 The 5th Moroccan School of Crystallography on "Structure solution from powder and single-crystal data" took place in Saidia on 24-26 October 2013, with more than 100 participants from Morocco, Algeria, Congo, Mali, Ivory Coast, Cameroon, Tunisia, France, Germany and Italy. Download this brand new movie-like poster from the promotional material section. The website of IYCr2014 activities in Spain is now available, with information about events for IYCr2014 being organized throughout Spain, and with news and links to some of the most active projects. In October 2013, two events were celebrated in Novosibirsk (Russia) to talk about crystals and crystallography with school children and among scientists. Both were very successful, as you can see for yourself from these videos, photo gallery and reports. Can you eat a crystal? "Can you eat a crystal?" "Noooo!!!!" "Well, I’ll show you: I will eat a crystal! Look!" and after eating a grain of table salt, we began to tell them about crystals of sugar, crystals of salt, crystals in chocolate, crystals in toothpaste and even in chewing-gum ... The exhibition The Room of Crystals took place in Parma, Italy, on September 27th, 2013 for children and for the general public. The exhibition Cristalli!, organized at the University of Padova to celebrate the theoretical and applied aspects of crystallography on the occasion of the International Year, opened on 5 October 2013 with an inaugural presentation and tour. 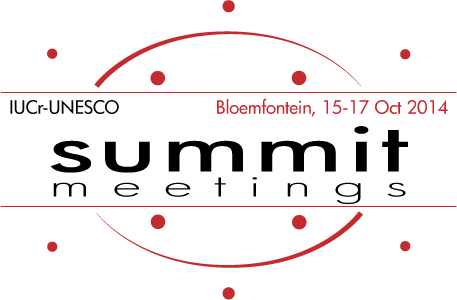 This meeting, which is to be one of the first official events of the International Year of Crystallography, 2014, as declared by UNESCO and the IUCr, provides a forum in which the greater Southern African scientific community can get exposure to recent developments in powder diffraction, as presented by internationally recognized leaders. And secondly, an opportunity for the African researchers, to present their own work in these areas to their national and international peers. See here for more information. A website dedicated to Crystallography and the activities that will take place for the International Year of Crystallography 2014 in France is now active at http://www.aicr2014.fr/. The website of the IYCr 2014 Japan Initiative is now available, with information about events for IYCr2014 being organized in Japan, fund raising, partnerships and collaborations, local coordinators, and some aspects of the history of crystallographic advances by Japanese scientists. 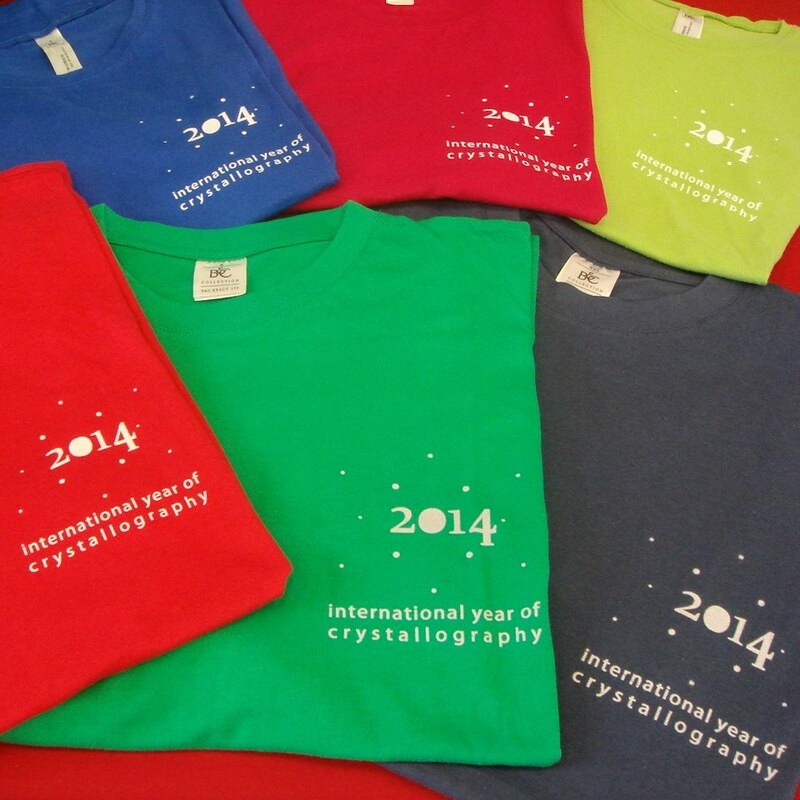 The United Nations has declared that 2014 will be the official International Year of Crystallography.